The Dr. Effie H. Jones Humanitarian Award is directly related to the AASA equity goal re: vulnerable children and superintendent pipeline issues. The Award honors leadership in educational equity and excellence. Those recognized must be AASA members who evidence commitment to the advancement and mentorship of women and minorities in positions of leadership and/or demonstrate a commitment to address social justice issues among children, youth and adults in schools. Jones was a school administrator, teacher, counselor, organizer of the Office of Minority Affairs at AASA and a champion of women and minorities in educational leadership. Equity and opportunity were the hallmark of her life work and closing the academic, health and social gap between the children who have and those who don’t was one of the cardinal intents of her rigorous efforts to increase the numbers of women and minority school system leaders. She created both a space where minority and women educators could be nurtured, supported, mentored, challenged and where the differing needs of children could be addressed. Because of her commitment to equity and excellence, the field of school leadership is richer, more complex, and more accessible to a wide range of qualified educators and AASA’s focus on vulnerable children and youth is sharp and unrelenting. The award is open to any AASA member who meets the criteria. All nominations are reviewed and judged by an independent committee external to AASA. Entries are judged based on how closely they match award criteria. To download the 2020 Dr. Effie H. Jones Humanitarian Award application and guidelines, click here. Wanda Cook-Robinson, superintendent, Oakland Schools, Waterford, Michigan,Traci Davis, superintendent, Washoe County School District, Reno, Nevada, and Karl V. Hertz, retired superintendent, Mequon-Thiensville School District, Mequon, Wisconsin and the AASA president (1997-98), were honored by AASA, The School Superintendents Association,with the Dr. Effie H. Jones Humanitarian Award. 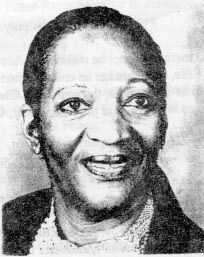 The Award, presented at AASA's 2019 National Conference on Education in Los Angeles, California, recognizes leaders who exemplify the leadership qualities modeled by the late Dr. Effie Hall Jones, an educator in Montgomery County, Md., and a former AASA associate executive director in the1980s and early ‘90s. Complete details about the award recipients can be found in the official AASA press release.